3GSM World Congress -- From day one Motorola said that the Q would come out supporting different network standards. Today the Chicago based company made good on that promise, enter Motorola Q gsm. For users that want 3G Motorola also announced the Q q9 today. It's a next generation Q with HSDPA. 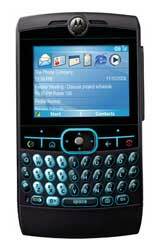 Besides supporting GSM, the Q gsm is also one of the first phones to feature Windows Mobile 6. The Motorola Q gsm will begin shipping in the second quarter. Pricing and carrier availability were not announced.